*The frequency of data collection varies across jurisdictions. Some jurisdictions have a 1-year data collection period, while others have a collection period of 2 or more years. The most recent data available is for the following periods: N.L. : 2012–2013; P.E.I. : 2007–2008; N.S. : 2012–2013; N.B. : 2008–2009; Que. : 2011–2012; Ont. : 2009–2010 to 2011–2012; Man. : 2012–2013; Sask. : 2008–2009 to 2010–2011; Alta. : 2008–2009 to 2012–2013; B.C. : 2011–2012 to 2012–2013; Y.T. : 2012–2013; N.W.T. : 2011–2012 to 2013–2014; Nunavut. : Not available. The Canadian average is calculated based on the most recent data for all available provinces and territories. Source: CICH graphic created using data adapted from Canadian Institute for Health Information. Children Vulnerable in Areas of Early Development https://yourhealthsystem.cihi.ca/hsp/inbrief?lang=en#!/indicators/013/children-vulnerable-in-areas-of-early-development/;mapC1;mapLevel2;/ – accessed May 22, 2017. 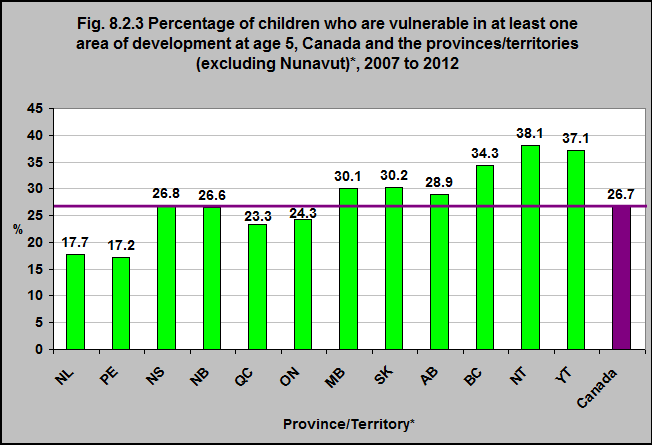 The proportion of children age 5 who are vulnerable on one or more of the domains on the Early Development Instrument (EDI)** score varies between provinces and territories. 38.1% were vulnerable in the Northwest Territories and 17.2% were vulnerable in Prince Edward Island. There are differences between how the EDI is administered between provinces and territories, as well as differences in how often it is administered. Therefore, the time period is not uniform – this needs to be considered when looking at differences across province/territories.